My throat was sore for days after the final regular season game in the Metrodome and I’d gladly cough up my spleen if it meant I could witness another game as good as, what is known to Minnesota Twins fans, Game 163. The Twins and Tigers had tied for the AL Central lead and only one could win it and move on to the American League Division Series. Days earlier, Minnesota found itself down three games with four to play. My friend Colleen was gracious enough to invite me and not a co-worker who she was closer with, but knew wouldn’t appreciate the game. As the crowd erupted for the first pitch, my hands instantly became sweaty and they would stay that way for 12 innings. In the third inning, Miguel Cabrera hit a two-run home run that went right in front of our seats. My depth perception did not register and I thought it was an easy out for Denard Span in centerfield. Nope. This made the score 3-0 Tigers. In the sixth inning, for a brief moment if you looked hard enough, I was on national television. Colleen had just returned with two beers and peanuts after waiting in line for two innings. With beer in my hand, Jason Kubel hit a home run that froze me. It was coming directly at me – not just my section – but me. I froze as the thought of a ball coming at me was an impossibility. I’m in the upper deck of right-center field – balls don’t come this high. Luckily, the ball hit the railing in front of the first row, ricocheted back to the field and not into my chest. Once I realized I was safe from the murderous Jason Kubel, I put my beer down and went nuts. It was at this point in the game when my voice started to go horse – the sixth inning. If this was World War II, the Germans hadn’t even taken over Poland yet. It was the seventh inning when the craziness really began and, once again, I stood in shock while the other 54,087 people went nuts. Nick Punto led off with a single. Denard Span struck out bringing up Orlando Cabrera, the Twins shortstop: a man who averages less than 10 home runs a season. As his line drive made its way to the second row in the left-field stands, I could only stand shocked and think, “That can’t be a home run. It’s Orlando Cabrera.” Thank you Tigers’ left fielder Ryan Raburn for not taking the Kirby Puckett/Torii Hunter course in how to rob a home run at the Metrodome. The little shortstop hit a two-run home run and the Twins had the lead, 4-3. While watching replays when I got home, I could hear the PA system blaring the Star Wars theme after the Twins hit home runs. From Section 209 with my own horse screaming and everyone elses along with the ground shaking, I never heard a peep from the speakers. The game’s over, I thought. We have Matt Guerrier and Joe Nathan to take care of things. We’ll win 4-3. Magglio Ordonez quickly took care of that thought as the first batter in the eighth for the Tigers. I dropped my head and stared at the ground before that line drive left the infield. I knew it was gone. After two walks and only one out, Ron Gardenhire smartly brought in Joe Nathan The best closer in Twins history looked like it when he induced a pop out to second and a strikeout. The ninth is when this game started to feel really special. After two consecutive singles in the top of the ninth off Nathan to put runners on first and third, things got scary. Placido Polanco, one of the hardest men in all of baseball to strike out (46 K’s in 675 plate appearances in ’09), struck out. Bullet No. 1 dodged. Next came Magglio Ordonez, owner of the 8th inning laser beam to left field. He hit another laser beam, but it was right to Cabrera at shortstop, who quickly threw a fastball to Michael Cuddyer at first to get the double play. I don’t know who went more ballistic, me or Joe Nathan. While Nathan was trying to throw his arm out with arm pumps, I was screaming my lungs out trying to get my voice box to come out of my mouth while jumping up and down with the rest of the section. When the chaos started to calm between innings, I screamed, “We can’t lose now!” Now, I love the Twins and nothing would make me happier than a win over the Tigers, but the guy sitting in front of me looked at the game like it WAS WWII. He was ignoring his wife and kids and I think I could see grey hairs forming on his head as the game progressed. With all of the pinch hitters, runners and relief pitchers, my scorecard started to look like a three-year old’s coloring book. Add the dirt from the ground and it has some character. After Brandon Inge spent the better part of the season dragging down my fantasy baseball team, he finally decided to get his first extra-base hit in 55 games to drive in a run in the top of the 10th. Not good. Tigers 5, Twins 4. A big thanks goes out again to Tigers’ left fielder Ryan Raburn for misplaying Michael Cuddyer’s line drive to open the bottom of the 10th. Another thanks goes out to the baseball Gods for helping that ball go just under the glove of Curtis Granderson and letting it roll to the wall and another thanks for Cuddyer’s hustle as he barely made it to third base ahead of the throw. ANOTHER big thanks to the baseball Gods for perfectly placing Matt Tolbert’s single between the second baseman and shortstop of the Tigers to score Cuddyer and move Alexi Casilla to third. The Twins were predestined to win this game! With Casilla on third, I thought the game was over when Nick Punto hit a line drive to Raburn in left field. From my seat, I didn’t see that Casilla got a late start after the ball was caught. Reminiscent of the Game 6 in 1975 between the Reds and Red Sox, Raburn made a perfect throw to nail Casilla and finish the double play and the inning. As the 11th inning began, I realized I was almost out of gas. I hadn’t eaten anything since Colleen and I had burgers around 2 p.m. and it was now going on 7 p.m. I’d been screaming and clapping so much my voice was disintegrating and my hands were sore. “I don’t know if I can take anymore,” I said to Colleen. Top of the 12th inning, bases loaded and one out – I’m not sure if I can take anymore without fainting. Ron Gardenhire said after the game, “People ask me why I always play Nick Punto. THAT’s why I play Nick Punto.” A hard grounder to Punto at second base. Many would have tried for the double play, but Punto threw home just barely getting the runner. It was a gutsy play and I did my best to go nuts, but it was getting difficult. Bottom of the 12th. Carlos Gomez, known as one of two “loose cannons” on the Twins by manager Ron Gardenhire, singled to start the inning. Cuddyer’s groundout advanced Gomez to second and Delmon Young was walked to set up the force. Up stepped loose cannon No. 2, Alexi Casilla. When Casilla’s single went between the first baseman and second baseman, once again, everyone went nuts a moment before I did. After that moment, I thought, “This could win it! This game might actually end!” I saw the entire Twins dugout empty onto the field and I thought, “I hope there’s not a play at the plate.” There wasn’t. The Twins won 6-5. Jumping up and down and screaming louder than I had all night, the greying man in front of me turned around for a high five as did Colleen. We watched the Twins celebrate on the field, circling the outfield and giving high fives to anyone in the first rows. TC the bear waved the Twins flag on a four wheeler and Ron Gardenhire calmly stood near the pitcher’s mound, giving hugs to all. Carlos Gomez never stopped running after his head-first slide to score the winning run. I can say that I was there, October 6, 2009, for Game No. 163. I was there when the Twins became the only team in the history of the game to come back from three games out with four to play to win their division. Farewell Metrodome! Your memories will never be forgotten. 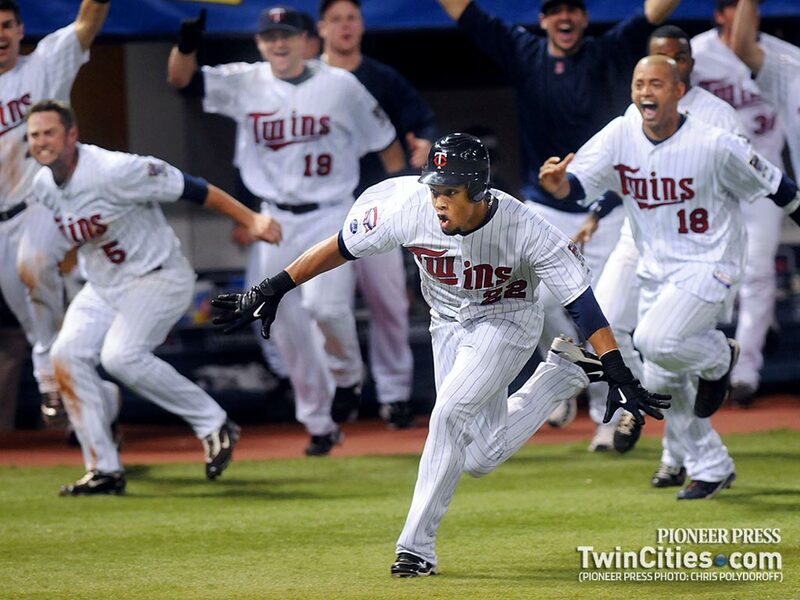 One of the greatest images in Minnesota Twins history. Carlos Gomez leads the pack.